Bodhi Wood | Some Dharma from "Rush Hour 3"
Some Dharma from "Rush Hour 3"
Singapore -- The biggest lesson I learnt from "Rush Hour 3" is that probably the easiest yet most effective way to dissolve racial tensions is to joke about your own race. Of course, do it representing yourself only, not your entire race - lest others of your race feel offended and betrayed by you! Your humour should not deman yourself (or anyone) of course - that's what we call good humour - the best being wit married with wisdom. The opposite is not true. If you joke about those of other races, especially in an insensitive manner, it might increase racial tensions! Your humour about others is not always funny to them, while others naturally find it funnier if you joke about yourself! 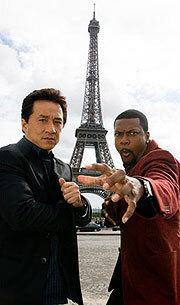 The "Rush Hour" trilogy is a buddy action comedy - about (mis)adventures of cultural clashes. Yet is is also about the joining of forces of two of different races and backgrounds for the single cause of fighting crime. Yes, the three poisons, of greed, hatred and delusion, which fuel crime, are always our common enemies; never each other. It is thus wiser to form partnerships, however unlikely they might be, to "fight" these defilements together - instead of fighting each other. In the first instalment, Jackie Chan goes to America - so it's a case of culture shock for him. In the second instalment, Chris Tucker goes to Hong Kong - so it's a case of culture shock for him. In the third instalment, both go to France - so it's a case of culture shock for both! But hey, culture shock need not always be frustrating. It can be fun and enlightening too - as you learn more about others, and more importantly, about yourself - through your interactions with others. You get to discover more of your limiting perceptions, delusions and attachments. And yes, you might realise you are more (or less) racist than you previously imagined too!